External Antenna, Cable and adapters designed for use with USA Credit Card Readers and Devices. Add On Amplifier Kit for USA Technologies E-Port Credit Card Readers. Kit includes all necessary adapters to add an amplifier to existing E-Port devices that are using the standard magnetic or optional high gain antennas. Add On Amplifier Kit for USA Technologies ePort Interactive Kit includes all necessary adapters to add an amplifier to existing E-Port devices that are using the standard magnetic or optional high gain antennas. 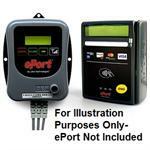 Add On Amplifier Kit for USA Technologies E-Port G10-s Credit Card Readers. Kit includes all necessary adapters to add an amplifier to existing E-Port devices that are using the standard magnetic or optional high gain antennas. Custom Cable Extension includes adapters to extend the external antenna on USA devices with SMA or MCX connections. 20" Pigtail Adapter Cable RG-174. MCX Male Right Angle to SMA Female.